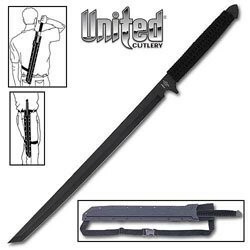 United Cutlery made the Black Ronin Ninja Sword good enough to actually use, though it's an odd blend of jungle machete and wakizashi. Like the Black Ronin Tomahawk, the Ninja Sword looks like a fantasy weapon until you get up close. Then it's surprisingly real. Made from one bar of 420 J2 high carbon stainless steel, there's not much put into this blade beyond heat treating and grinding. The dark coating adds to the ninja mystique of the armor-piercing tanto sword. The grip is only a tight wrapping of black nylon cord around the full tang handle, but it's good enough for a secure if not comfortable hold. A rudimentary bolster and hooked pommel ground from the original blank add a touch more hand security to this very primitive grip. If you do use it for chopping brush, that may keep a jarring blow from knocking this light 27-inch machete/sword out of your numbed fingers. Sharpening will be essential if you plan to do any real work with the Black Ronin Ninja Sword, but the temper of the steel works easily with ordinary stones -- even better with diamond whetstones -- and putting a good edge on the 17.25-inch cutting length is very possible. The hard plastic sheath fits either over the shoulder for a behind-the-back system or straps to belt and thigh for wearing on the hip. While the sheath isn't beautiful, it's a better approach than a nylon fabric scabbard and isn't likely to be damaged by the blade's tanto point.